Este artigo é sobre the Tribunal god Sotha Sil. Para the city of the same name, veja Clockwork City. After Nerevar's death, the councilors of Nerevar and the Tribunal of Vivec, Almalexia, and Sotha Sil came to power among the Dunmer. They then went against Nerevar's dying wish by using the profane Tools of Kagrenac on the Heart of Lorkhan in order to steal its divine essence for themselves. They achieved great heroism with their divinity, but their powers waned steadily after the awakening of Dagoth Ur and their loss of Kagrenac's Tools. Dagoth Ur's mad passion, proximity to the Heart, and superior strength and intelligence allowed him to appropriate the Heart's boons from the Tribunal. During the end of the First Era, around 1E 2920, Sotha Sil spent some time on the Isle of Artaeum, where he taught some of the new mages of the Psijic Order. In 2E 882, when the Tribunal visited the Red Mountain for a ritual to replenish their divine power, the reawakened Dagoth Ur and his minions ambushed them and drove them away, cutting off access to the Heart of Lorkhan. The Tribunal were able to kill Dagoth Ur and his kin after this initial setback, but they were always revived by the Heart. To contain them, the Tribunal erected the Ghostfence around Red Mountain. In 3E 417, after centuries of becoming weaker and more desperate, Sotha Sil and Almalexia lost two of Kagrenac's Tools, Keening and Sunder, to Dagoth Ur's forces. 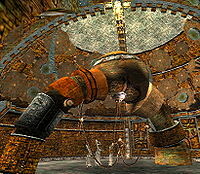 Vivec rescued them, but they could not recover the stolen Tools and had to flee Red Mountain. Sotha Sil once spent time counseling, guiding, and protecting mortals, loving them perhaps more than either Vivec or Almalexia. He is said to have felt the stress of each of his people, but assigned them no more load than he knew they could bear. In time, Sotha Sil became almost completely detached from the real world. He gradually lost touch with the affairs of the Dunmer, the rest of the Tribunal, and eventually all of Tamriel. Losing Keening and Sunder was his last known participation in mortal affairs. He was killed in 3E 427 by his long-time friend and fellow Tribune, Almalexia, who had been driven mad by the decline of her power due to being deprived of the Heart of Lorkhan. Esta página foi modificada pela última vez à(s) 20h57min de 15 de dezembro de 2015.